Bagaimana menghitung License SOLARWINDS NPM ? All-in. No Add-ons. No Extra Costs. More than 150,000 IT administrators around the world already put their trust in PRTG every day. PRTG is the only all-in monitoring solution that covers all aspects of network monitoring. We have seen that a single license pays back on average in 3,5 months. The prices are shown without VAT. You can choose your maintenance plan for your licensed edition. During the maintenance term you may download all new versions and updates of the purchased product and you are entitled to support. 12 months software maintenance is included in the license price. You can buy extra maintenance at a discounted price: additional 12 months maintenance at 5% discount or additional 24 months maintenance at 10% discount. Order online and pay with your credit card (MasterCard, VISA, American Express), by bank transfer or check. Corporate customers or public organizations may order by PO. How is SolarWinds Network Performance Monitor licensed? Unlimited elements of each type are based on a recommended standard polling rate (SLX). For example: An NPM SL2000 can monitor up to 2000 interfaces + up to 2000 nodes + up to 2000 volumes. Q: Can I buy multiple licenses of SolarWinds Network Performance Monitor (e.g., an SL-100 and an SL-250) and monitor all 350 network elements from the same web console? A: No. A SolarWinds Network Performance Monitor license allows you to install a single database, and each database is associated with a single web console. Q: Is the SLX unlimited? A: The SolarWinds NPM SLX license entitles you to monitor an unlimited number of elements, but the throughput is rate-limited. Most customers will be able to monitor about 10,000 elements per polling engine (main or additional) with standard polling intervals. For more technical details, see this KB or speak with an SE. Q: Can I just use better hardware to poll more? A: No, the software enforces a throughput rate. However, if you change the polling interval to poll less often, it is possible to monitor more than 10,000 elements on a single server. For details on how the throughput rate is enforced see this KB . Just knowing what's up and what's not in your IT is no longer sufficient. Go beyond Ping, with OpManager's Business Centric Philosophy. Let your IT Management take a proactive stance by promising high availability, and delivering it as well. Know the service criticality, and the consequent business impact before an issue even manifests. As the IT head of your organization, be it with networks, data centers, or both, you would know the weight of the responsibility for the perfect running of all your business services, and the gravity of its possible breakdown. For a hypothetical business critical service, let us assume that you are responsible for the 'Voice Over IP' services (VOIP) of your company. This uses a Cisco Call Management Gateway and a secondary Gateway for redundancy, 150 IP phones and 100 desktop soft phones. If any of these devices go down, the organization's critical communication service gets directly affected. 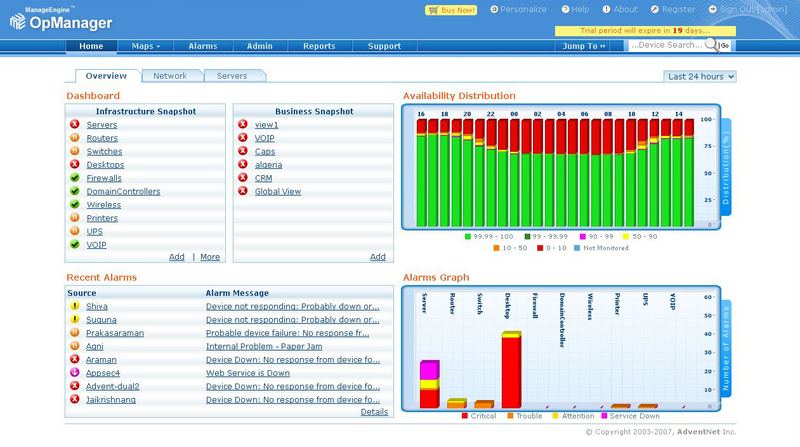 Traditionally, you would get an alert every time a device went down, irrespective of its business criticality. Thus, you are forced to either give the same priority to all devices, or had to manually prioritize while raising a ticket. 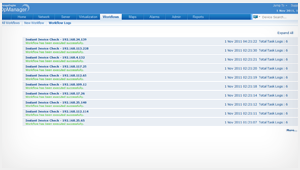 With OpManager, you now know right from the beginning as which service gets affected and how. This would enable you to ensure that the negotiated service levels are acted upon before they are exceeded. Giving a service centric eye to your entire system means you can directly view information about your businesses. 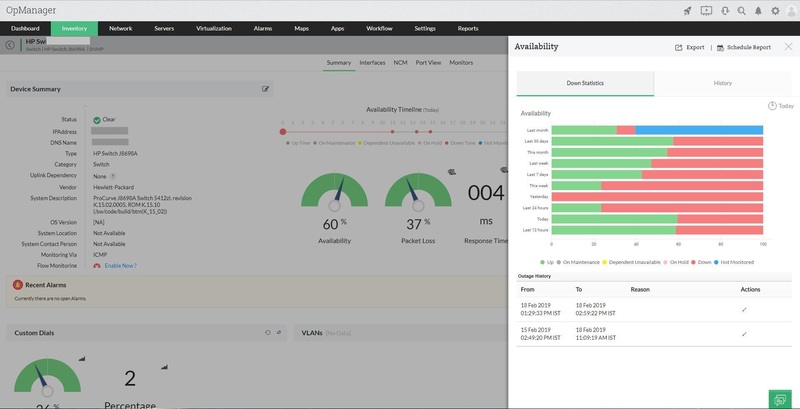 With availability reports, you can graphically analyze the percentage that the given service has been running without any hindrance, during the specified period. You can now view real time availability of a particular service, and also pull out historical data for any specified period. While checking the availability distribution over the past 24 hours, you may notice that the mail service had been down from 10pm to 11pm. You can then drill down and find that the server had been down for that period. Upon investigation, you realize that the servers were being patched at that time. You then just have to add a note about this on the availability report for 10 to 11pm before sending it to your boss as e-mail. No one knows the pain of a missed or exceeded service level, as much as an IT manager. It doesn’t even matter whether the customer is internal or external. Being responsible for ensuring 99.99% availability for the VOIP and e-commerce services, you would wish to know the percent unavailability level so far. Both these services are business critical, and have an outage on the last day of the month. You need to prioritize between them. All you have to do now is look into their availability statistics and notice that the e-commerce service will exceed the negotiated SLA in two hours, while the VOIP service has five hours to spare. With this information, you can prioritize according to what needs immediate attention. Orienting your IT to your business means you get complete real time analysis of your network’s impact on your business. Keeping your IT on track with your business is the best way to reap the complete benefits of your infrastructure systems and processes. With OpManager’s business level dashboards, you can see how and where your business is getting affected on a continuous real time basis. Every time a device failed, you had just had to blindly fix it and just get it working. You had no data on its correlation with other devices and were forced to react mechanically. Now, you might notice that the devices on a particular service say e-commerce, go down more frequently. Consequently, you could see patterns and choose on a more appropriate course of action (such as increase the capacity for the devices on that service). Administrators have preset routine (run book) tasks to perform either during network faults or as an on-going maintenance task. These first level troubleshooting steps and repetitive laborious maintenance tasks can now be orchestrated and automated through powerful IT workflow automation engine. 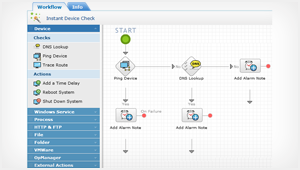 Code-free IT workflow automation with out-of-the-box checks and actions. Over 70 workflow checks and actions grouped under 9 different categories, including VMware ESX actions are available for you to construct a powerful workflow rule to suit your IT management need. 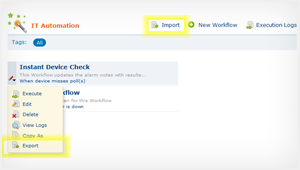 Just create workflows using these out-of-the-box checks and actions to the workflow builder and you are good to go. to help you build workflow rules quickly. The intuitive drag-n-drop workflow builder makes it really straightforward to create new workflow rules for every administrator. 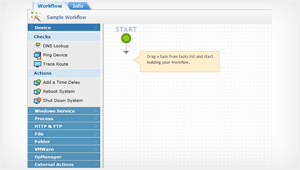 Besides defining new workflows, you can modify an existing workflow by making changes to the conditions or actions inside the workflow builder. can be initiated when there is a network fault, or as on-going maintenance tasks, or even on an ad-hoc basis. 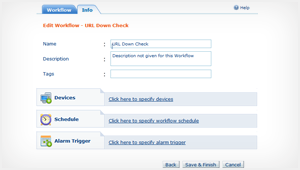 OpManager IT workflow automation module gives you the free hand to trigger workflow in all the aforementioned situations. Using OpManager, seasoned administrators who are well-informed of their organization’s IT setup, can create IT workflow rules to meet the organization’s requirement. Contextual workflows address your specific IT automation needs, leading to minimized downtime and reduced time to repair a fault. These structured, time invested, useful documents can now be preserved as XML files with the option to export the workflows and also import them even into other instances of OpManager when there is a need. Every executed workflow is recorded under "Execution logs" for future audits. This report comes handy when the administrators want to make sure what has happened during a particular workflow execution.